Merakindie is proud to present ‘COLLISIONS’, an evening of audio-visual excursions in expanded cinema, by artists Robert Curgenven and Darren Kirwan. This very special and unique event in the newly renovated Cyprus Avenue with impressive state of the art sound system and subs, brings us two exclusive performances that arrive at the intersection between light, sound and experience. Each artist uses his own custom-developed systems to deliver a spectacle that threatens to disturb, provoke and transform its viewers: subsonic frequencies, precision sound design, synaesthetic light projections and fog create an unforgettable multi-sensory experience. Jason was conceived over the course of a handful of chaotic sessions at the band's Cork recording studio. During this period, the band were straying from the idea of working on typical song structures and instead exploring the outermost reaches of the collective process of improvisation (known colloquially as "jamming"). These lengthy jams were recorded live in the room with a minimum of equipment and technical fuss, with a view to capturing the sound of the spontaneous musical interactions through a fuzzy auditory lens. In terms of sound and vibe, the records of early 70s African psychedelia were to be a mental benchmark for the band. Ultimately, these jams were edited, spliced, re-purposed and flipped to create songs of sorts, and vocals were scribbled into the picture where necessary. The result is a dank, groove-centric record; a collage representative of the communal brain which is tapped into at the most transcendent, super terrestrial moments of discovery. The playing is pure and unguarded while grooves bubble and sway in sympathy with the collective wandering. The album form itself is dealt with loosely, with the result being more of a stream-of-consciousness mixtape scenario. It could easily be imagined as a forgotten gem found deep in the vaults of the discerning crate digger - equally effective for a late night listen on headphones or a slow cruise through town on a hot, sticky day. In the name of Axel's rod, we give you... Jason. Tickets for the Dali show are on the door only. Merakindie is proud to present Elaine Malone & Sam Clague Double EP Launch show at Coughlan’s Live. Psych folkstress Elaine Malone, who’s recently released stunning EP ‘Land’ will be joined by the inimitable Sam Clague for a double launch of their respective EP’s at Coughlans Live on November 8th. Tickets 10e on sale from Coughlans/Merakindie. Sam Clague is a musician and songwriter from Clonakilty, Cork. He lives and works in Cork City, playing primarily as a jazz guitarist and also his own unique brand of original music. Jazz and folk influences blend together to make a form of kaleidoscopic chamber music, driven by intricate guitar arrangements and accompanied by psychedelic orchestral sounds. His debut EP “Balloons” was released in 2015 at the Clonakillty Guitar Festival. He plans to release his follow up E.P. at the festival in september this year. Merakindie is very proud to present a double header gig - Speakulativ Fiktion & Transmission Club at The Roundy, Cork on August 4th at 9pm. Entry is 5e. Spek is a Cork based rapper and beat maker working in the doomy side of hip hop. He has performed on the Irish festival circuit and warmed up for interntaional heavyweights such as Danny Brown, Immortal Technique and Shabazz Palaces. Transmission Club is a band from Cork, Ireland. The band's diverse sonic palette combines elements of indie, folk and grunge, textured with harmonium, violin, keyboards, guitars, drum machines and loops. In November 2015, Transmission Club released Salt, an E.P. collection of demos. Salt gained airplay on The Alternative with Dan Hegarty (2fm), The Paul McLoone Show (Today FM) and on 8Radio. Transmission Club also recorded a live session for The Paul McLoone Show in January 2016. Salt was voted No.1 in The Last Mixed Tape's Reader's E.P of the Year 2015 Poll. Tranmission Club has played extensively around Ireland, garnering notable support slots with Otherkin, Cry Monster Cry, The Vincent(s) and Barry Sutton (The La's). They also featured at the Clonakilty International Guitar Festival 2016. Physical copies are available in Music Zone, Douglas, Alchemy Coffee and Books, Bunker Vinyl &Studio and Tower Dublin, Dublin. "Indeed, there is a big warm sound to ‘A Weak Heart’ that finds it’s place between the stark emotion of Villagers and raw reverberations of SOAK"
Improv psych-pop outfit The Bonk joined on the road by experimental improvisers Fixity. 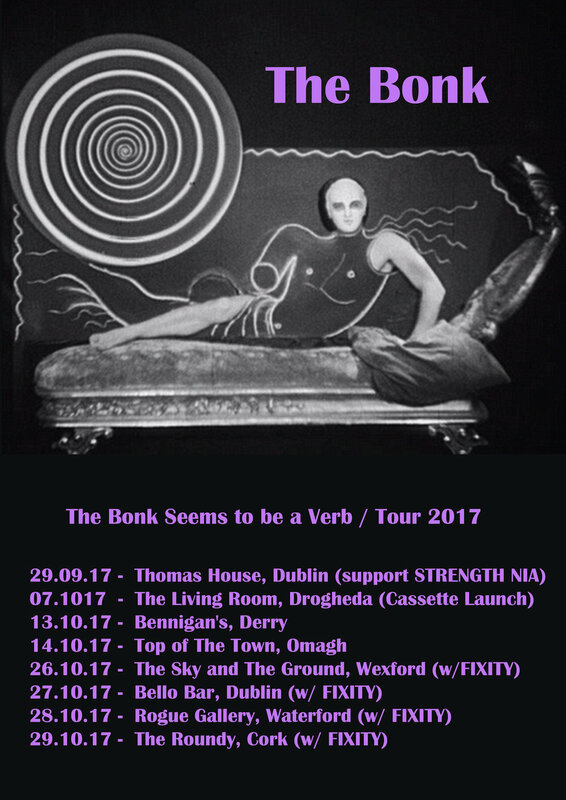 THE BONK are marking the October release of their debut album The Bonk Seems To Be A Verb with a string of live dates, inviting Cork’s Fixity to co-headline on the last leg of the tour. The Bonk perform compositions by Philip Christie (O Emperor) that mix ’60s garage, jazz and experimental pop influences with recursive rhythms and improvised melodies, all rendered in loose, minimalist song forms. The group launched their debut single Ancestor at Quarter Block Party 2016 in Cork; two further online releases followed. Cipher, their third single to date, was released in April 2017, when the band undertook their first comprehensive tour. The Bonk Seems To Be A Verb will be available as a limited edition cassette release on thirtythree-45 from October 6th 2017. The music of FIXITY is composed by Dan Walsh and explored in collective improvisation with others, the music is driven by their involvement in time and the beautiful impossibility of stillness or repetition within it. The collective’s self-produced releases include Live In What Used To Be A Church, recorded in St Luke’s Church in Cork City. Their recent album The Things In The Room was recorded in Tambourine Studios, Malmö, and was released on the Cork-based label Penske Recordings as a double LP and CD in late 2016. An Irish tour followed in June 2017. The band personnel included Walsh, regular collaborator Emil Nerstrand, Carolyn Goodwin (Clang Sayne), Philip Christie (The Bonk/O Emperor), Kevin Terry (Sky, Horse & Death/Altered Hours) and Neil O'Loclainn (Ensemble Eiru/Cuar). These autumn dates will feature new music which will be released later in the year. 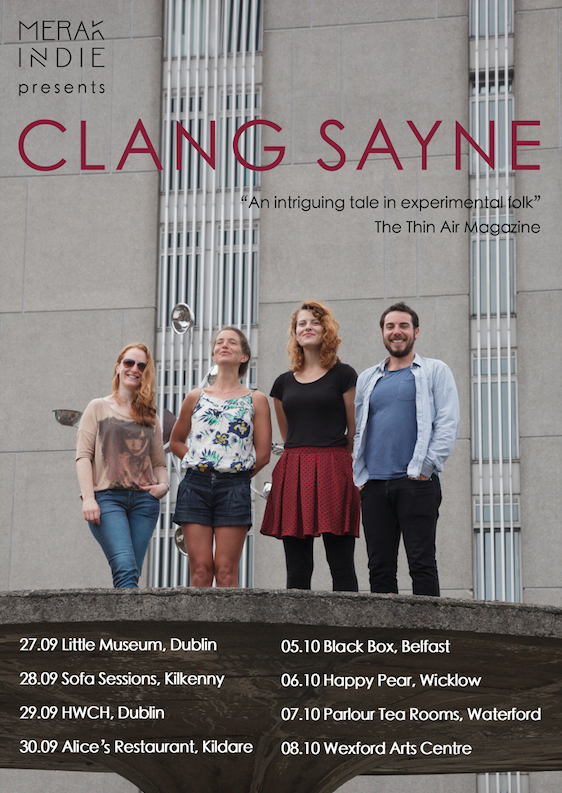 Merakindie is very proud to present an 8-date Clang Sayne tour around the country later this month, during which they will hijack the ears of all and sundry with renditions from their March album release, 'The Round Soul of the World'. Clang Sayne was formed by Laura Hyland in London in 2008 to fuse myriad influences spanning folk song, sound art and literature into a soundworld she describes as 'songscape'. Reviewers have dubbed it an "an uncategorizable approach to songcraft" and "exhilarating in its refusal to conform". Currently based in Ireland, the group features Laura on voice and guitar, Judith Ring on voice and cello, Matthew Jacobson on drums and voice, and Carolyn Goodwin on bass clarinet and voice. 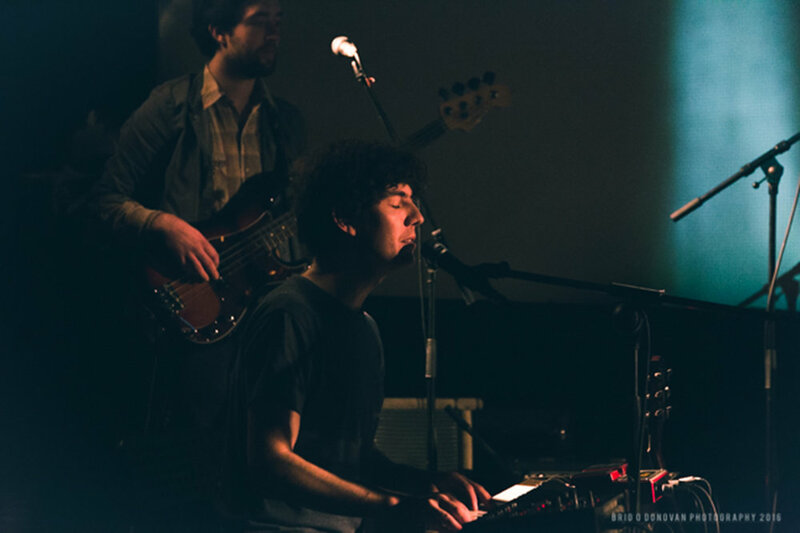 They independently released their new album, 'The Round Soul of the World' in March 2017. A live version of the song 'Blackbird' from the album can be found here. Thursday 28th: The Sofa Sessions at Billy Byrnes in Kilkenny on Thurs 28th, followed by HWCH in Dublin again on Friday 29th. Saturday 30th: Alice's Restaurant (Laura Hyland solo set). Sunday 8th: Wexford Arts Centre featuring recent collaboration with the incredibly talented David Begley Artist. David has made a series of seven prints in response to the seven pieces on CS album. You can check out his work at www.davidbegley.com . The prints will be exhibited alongside the lyrics from each of the songs, and will be projected lifesize behind as they play. "[Winterlands] revealed the spellbinding poetic lyricism of Hyland’s songwriting, together with the group’s innate ability to channel their diverse influences (jazz, folk, sound art, traditional) into their own distinct sound. Their captivating sound and thrilling lyricism continue to expand and flourish on the band’s follow-up, “The Round Soul Of The World”. Released in March of this year, the group’s second album is a stunning achievement in distilling myriad themes (chiefly those of mortality, death and love) in such a quietly breathtaking and poignantly moving way. " Paula Cox Music, Paul Creane and The Man Whom will be sharing a stage and playing on each other's tracks, promoting their three singles 'Let's Play A Game', 'I Need You Here To Love Me' and "Four Hurdles' respectively. We are touring in very special venues across Ireland, some well known for hosting music events, others being a first time ever hosting live music. All sharing the same attitude as the artists - inspiring collaboration and community. We're very excited for this one and hope you will come enjoy the magic with us. Paula Cox is a highly-rated vocalist and songwriter. An early starter, she was lead singer in The Bush, The Tree & Me when only 14. Signed to Epic in 2000, they recorded their first album with producer Stephen Street (The Smiths, Blur). Following her move to Ireland she has performed and recorded with Colm Mac Con Iomaire, Cathey Davey and The Frames. Her solo album, to be released in 2017, will be mixed by Cenzo Townsend (Florence And The Machine, Snow Patrol). Its stunning lead track ‘Let's Play A Game’ is out now. Paul Creane is a songwriter from Wexford. He has released two albums to critical acclaim with The Changing Band, Tommy Black & the Twelve Days of Lucy and The Clock, and has toured worldwide for the last decade. His new single ‘I Need You Here To Love Me’ features in the movie Staid, upon which he had a leading role. His first solo album 'One Trick Blue' will be released later this year. The Man Whom, aka Ian Doyle, is a singer-songwriter, producer/composer and multi-instrumentalist from Wexford. In 2011 Doyle released his debut album The Greatest Event, described by Sunday Times as “a slick production with accomplished musicians, elaborate scores and scrupulous string arrangements”. His single ‘Four Hurdles’ is from his forthcoming album 'The Dancer From The Dance' which was recorded in New York, which will be released in May this year.